The City of Ferndale provides complimentary curbside leaf pickup to residential streets each fall between mid-October and the beginning of December. 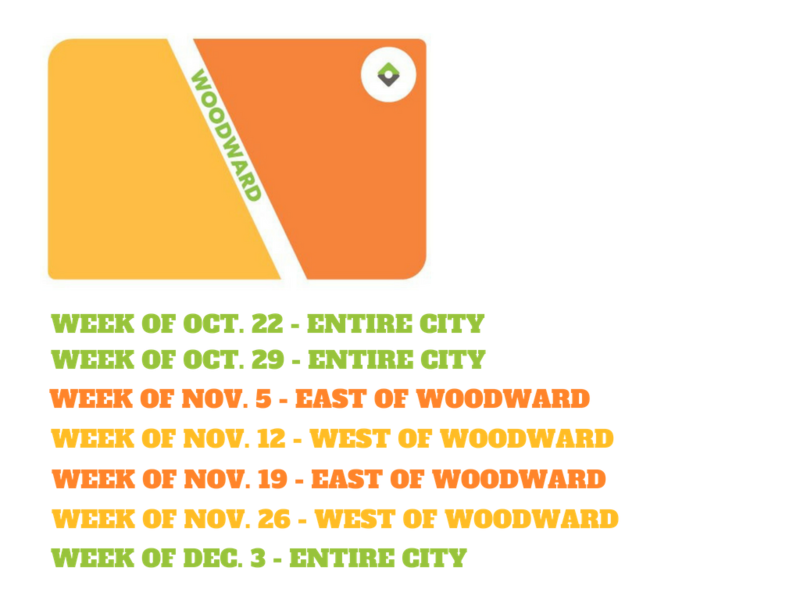 Every street receives pickups according to the schedule below. To have your leaves removed, simply rake them to the curb by 7:00 a.m. on the Monday of your scheduled week and DPW will pick up by the end of the week. No need to call. Scheduled leaf pickup replaces the on-demand system of the past, which means there’s no need to call and report leaf piles on your street—on scheduled weeks, DPW will service your street at least once. If you miss a pickup, please wait to rake your leaves out until the weekend before your next scheduled pickup week; leaves piled high or for long periods of time can create parking hazards. Whenever possible, park away from leaf piles so that DPW can access them. How do I take part in curbside leaf pickup? Our Department of Public Works (DPW) services all Ferndale residences. Simply rake your leaves to the curb by 7:00 a.m. on the Monday of your scheduled week's pickup and DPW will be by before the end of the week to vacuum them. Is it okay to include sticks, rocks, and other yard debris in my leaf piles? No. The City's leaf pickup trucks are not able to process sticks, branches, stones, and other such debris. Including these items in your leaf piles harms our machinery and creates a slower leaf pickup process for all. Please do us all a favor and keep your leaf piles pure. Sticks, branches, and other similar yard debris can be placed out for yard waste recycling on your regular trash day. Make sure they're placed in brown paper recycling bags or canisters with clearly marked recycling stickers (available at the DPW office). When is curbside leaf pickup? The City of Ferndale's curbside leaf pickup runs annually from roughly the third week of October through the beginning of December. Dates vary by year; this year's dates and other important information is published on the page above.